A longer wheelbase, sloping roofline and larger tires help give the B class a more dynamic look. 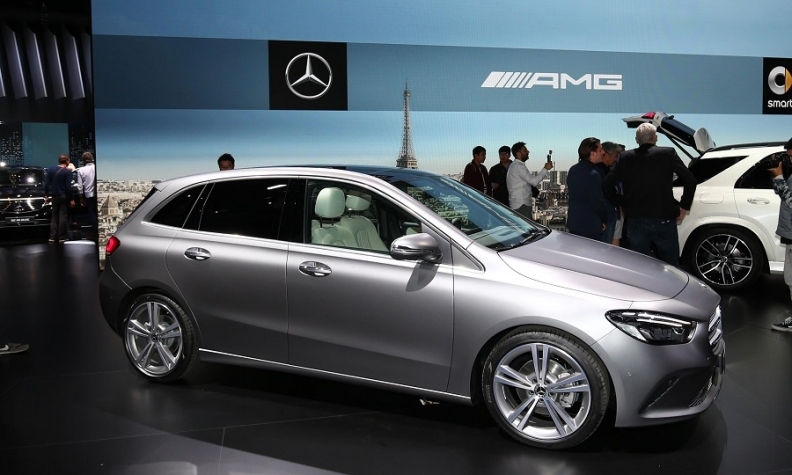 PARIS -- Mercedes-Benz believes the new, more emotionally styled B class, will offer the kind of modern comfort that compact minivan buyers demand when making their next purchase. The automaker said the B class puts the "sport back into sports tourer" by lowering wind resistance and noise thanks to improved, class-leading aerodynamics with 0.24 drag coefficient. A long wheelbase combined with short overhangs, a dropping roofline and larger tires also gives it more dynamic proportions. Sales and marketing chief Britta Seeger emphasized the car's interior comfort during a presentation at the Paris auto show. She praised the B class's greater all-around vision, elbow and head space as well as an intelligent MBUX infotainment system that connects to devices like an Apple Watch or Fitbit. "This car now has an onboard coach that analyzes the traffic situation, weather conditions and duration of travel to suggest a suitable energizing comfort program to make you feel good, and we are the first ones to combine such a feature with vitals taken from your wearable," she said during the debut. "The seat also moves ever so slightly to prevent you from sitting in one position for too long to reduce the risk of back problems," Seeger said. Additional features also give the B class the safety level of an S-class sedan, she said, such as an expanded Active Brake Assist that now monitors for crossing pedestrians and cyclists. Over 1.5 million B-class minivans have been sold since the model first launched in 2005. Soon after the debut of the second generation, sales rose to 120,000 units in 2012, but demand slumped to just over 62,000 last year.